The lastest Star Wars prequel tells the story of the galaxy’s greatest smuggler and what he was up to before he teamed up with Luke and Leia in the original movie. We follow Han as he meets his best friend Chewie, and makes new alliances as he pulls off heists and fights new enemies. If the record-breaking sequels weren’t already enough, Lucasfilm has decided to come up with spin-offs that take place after the prequels but before the original trilogy. First we had Rogue One, about how the rebels got the plans for the Death Star, and now Solo, focusing on the past of one of cinema’s most beloved heroes. I can’t say these Star Wars Stories are the strongest of the franchise (though definitely better than the George Lucas prequels), but they’ve still got plenty for fans to enjoy. 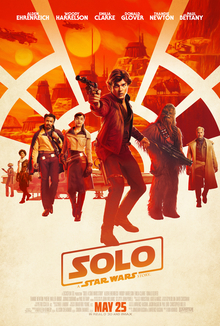 I still feel that these spin-offs are missing the heart and emotional strength that the main installments currently have, but so far they have the right mix of fun and nostalgia to be worth the trip to the theaters especially for fans, and Solo is no exception. It’s got plenty of entertaining action sequences and brings back some of the memorable characters we love from the original films, which includes not only Han and Chewie but also Lando Calrissian. Alden Ehrenreich, who you may remember from the Coen brothers’ recent work Hail, Caesar!, doesn’t perfectly capture everything Harrison Ford brought to the role but on his own he carries the movie with charm and spirit. The bar is set high for a performance of a legendary character from a legendary actor, and it’s tough when you’re expected to imitate another performance, and though he’s nowhere near as charismatic and fun as Ford was so brilliantly, he still was a good choice and did a nice job bringing the adventurous sense to the character. Also great is Donald Glover as Lando, who’s probably the standout of the film, as he gives a strong interpretation of the character with also lots of enjoyment to him. Woody Harrelson is always great, and here is no exception and Beckett, and Emilia Clarke as Q’ira is a well-realized partner and anchor for Solo’s character. Also worth-noting are Phoebe Waller-Bridge and Jon Favreau in noteworthy voice roles, and of course, don’t forget to be on the lookout for the once again lovable and awesome wookie Chewbacca. Ron Howard directs Solo with a beautifully realized visual style and excellent CG-planets and settings created in front of your eyes. The cinematography and color palette is marvelously done and the screen is always filled with wondrous settings and creatures. The action is very entertaining, from heists to chases on the Falcon, some moments will definitely have you on the edge of your seat. Despite the fun action, filmmaking, and cast, I feel this movie could’ve used stronger writing. We see how Han does things like meeting Chewie and Lando, as well as getting the Falcon, but most of the notable events that Han does in the movie have already been explained through exposition in the original trilogy. There isn’t much change for Han on an emotional level to justify why we need this movie to precede the original film. I expected to learn more that’s new about Han that we haven’t learned about already and that’s important to know about his past, but nothing really powerful impacts Han on a substantial level that brings him to be the person we’ve come to know in the originals. Despite a connection to a lover that is established well, there aren’t too many strong character relationships that he has, and some of the story arcs aren’t really figured out by the end and feel a little contradictory to what’s set up earlier. There’s also a cameo at the end that shocked me but doesn’t do much else other than set up who knows how many more spin-offs. Solo is definitely a fun time that offers a lot of entertainment and many Star Wars fans like myself will enjoy, but I felt it was missing the strong script and heart that the sequel trilogy installments like The Force Awakens and The Last Jedi have both realized so fantastically. Solo misses some of its potential to be as great as I was hoping, and though it’s definitely a fun ride that I’d revisit sometime and future generations will enjoy watching along with the other films, doesn’t completely justify its existence and misses some emotional marks that I think it could’ve gone for (which I feel Rogue One missed some of as well). Definitely watch it if you’re a Star Wars fan, it’s a solid film with good work from Ron Howard and the cast, but it’s far from the franchise at its best like we’ve known to love it in the past. This entry was posted in Action, Science Fiction. Bookmark the permalink.